2011 Servant Leadership summer art and culture interns. Photo courtesy of The EASL Report/Emory Center for Ethics. Belk Inc. today announced a partnership with the Emory University Center for Ethics to establish the Belk Community Leadership Fellows as part of the center's Ethics and Servant Leadership Program. 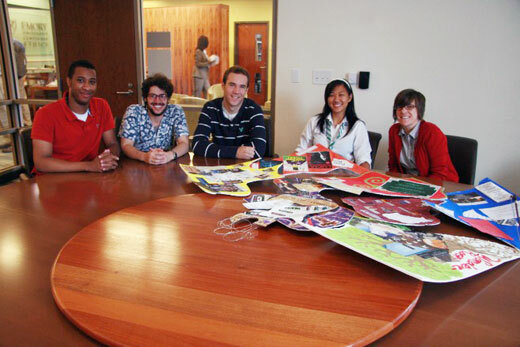 The exclusive internship program promotes civic engagement by connecting high-performing students with local community organizations. The multi-year partnership will fund five of Emory's eight-week internships annually with community organizations that include long-term Belk community partners – the Junior League of Atlanta and YWCA. "The Emory Servant Leadership program aligns with two of Belk's focus areas—supporting education and strengthening communities," says Dave Penrod, chair of the Belk, Inc. Southern Division based in Atlanta. "We believe the program will provide a great opportunity for young leaders to recognize the value of community involvement through their active participation with highly respected community organizations." In order to preserve the authenticity of the experience, The Ethics and Servant Leadership Program will not count for academic credit, but provides students with unique learning opportunities unavailable in the classroom. The eight-week summer internship, which begins in May and continues through the summer, will require 240 hours of service and includes classes designed to provide students with basic leadership and ethical skills and an opportunity to process their experience. "Students will learn about different approaches to business and decision-making processes that shape nonprofit organizations," says Edward Queen, director of Emory's D. Abbott Turner Program in Ethics and Servant Leadership. "We hope the program forms a lasting bond between future leaders, the business community and local philanthropies. That's an equation for responsible growth and success if there ever was one. I'm eager to see the effect the program has on the community as our students, business partners, and collective sense of giving grow together in Atlanta." JLA – The Junior League of Atlanta, Inc. is an organization of women committed to promoting volunteerism and improving the community through the effective action and leadership of trained volunteers. YWCA – The Young Women's Christian Association works to diminish prejudice and empower women through education and advocacy in the legislative arena. Park Pride – Park Pride works with community groups throughout Atlanta to improve and maintain community parks and to advocate greater support for community parks. Sagal Radio – Sagal Radio Services is a community-based nonprofit radio station broadcasting in English, Somali, Swahili, Amharic, Karen and Bhutanese-Nepali in order to assist refugees and immigrants in addressing the challenges of their new lives in the U.S. and in becoming healthy, active, and informed members of the community. Forever Family – Forever Family provides children of incarcerated parents with supportive, educational, and positive programming designed to improve their opportunities and to maintain family connections. Charlotte, N.C.-based Belk Inc. is the nation's largest privately owned mainline department store company with 303 Belk stores located in 16 Southern states. The company was founded in 1888 by William Henry Belk in Monroe, N.C., and is in the third generation of Belk family leadership. Its belk.com Web site offers a wide assortment of fashion apparel, shoes and accessories for the entire family along with top name cosmetics, a wedding registry and a large selection of quality merchandise for the home. To connect with Belk via Facebook, Twitter, blog, mobile phone text messages or by email, go to: Belk Get Connected. An international leader in the field of ethics, the Center for Ethics is dedicated to exploring how ethical issues underlie the decisions that shape our minds, lives, and society. The Center's work seeks to inspire and advance scholarship and education in ethics, to ignite the moral imagination of leaders in all walks of life, and to foster lives of moral meaning and ethical engagement. For more information go to ethics.emory.edu or follow us on Facebook.